For some time now the trend has been for large national corporations to use their buying power to price their smaller competitors out business. Nothing particularly wrong about that, it is the result of a almost free market (these big fellas usually get sweet tax and zoning deals) and no one is crazy about paying more than they should for something. The small business person usually makes the mistake of trying to beat the big boys at their own game – offering low prices – but it is just about impossible for them to do so competitively. Instead, what they should concentrate on is how they are different from big box stores – better service, less hassle, better quality, a more knowledgeable staff – things that are quickly going by the wayside. Even so, I tend to cheer for the underdog and I’m not too crazy when another big time operator moves into town. I first heard about this upscale New York supermarket chain (out of Rochester with 71 stores) about three years ago, when I was working for an established gourmet grocer in Baltimore. Panic nearly took hold of upper level management when we got word that Wegmans was coming to town. I had never heard of them before and couldn’t imagine a full line grocer being able to give us a run for our money. Boy was I wrong. This past weekend I took a trip up north of town where Wegmans has opened their first store in Maryland. Absolutely unbelievable! The left three quarter section of the big store is devoted to selling your typical grocery fare, and at very competitive prices. The rest of the store is all about fresh, high quality food coupled with excellent and friendly service. Sort of like Whole Foods but even better. And without the snobbishness. Looking like something out of Epcot Center, it resembles the piazza of a Mediterranean village, with each store front situated on the square an ‘open air’ market. Artisan bakers, a conditerei, a butcher shop offering prime meats, exceptionally fresh seafood, organic produce, freshly prepared sushi, chef’s offering take home dining, a quiche shop, a real honest to goodness Kosher deli, every cheese and pate’ imaginable, a pie merchant, a food court offering a coffee bar with barista, gourmet sub shop, pizza parlor, soup kitchen, tremendous salads and an Asian foods bar. And a produce market you wouldn’t believe. On the second floor, in balconies situated around the market square, are café style tables and chairs from which watch people shop while enjoying your lunch or dinner. What a concept! 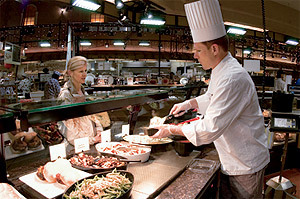 A gourmet food market, combined with a restaurant, a caterer and a full scale grocery store. With prices that are better than the local Super Fresh. It was no wonder that the place was mobbed. If the established chains aren’t paying attention, they oughta be. Right now, if I were working for a Safeway, Giant, Superfresh, Mars or Food Lion in Columbia or Ellicott City, Maryland I would consider dusting off my resume. That’s where their next store will be built, in 2009. I have to applaud companies like Wegmans, who are successful because they make commitments to excellence, rather than just discount pricing. And while providing the best possible foods, at competitive and fair prices, they also pay attention to social and environmental concerns. In Wegmans, recycling was encouraged and accessible, for staff as well as the consumer. Fair trade and organic products were in great supply and highly visible. The service was efficient, friendly and informed. (Not too surprising since Fortune Magazine rates Wegman’s as the third most desirable US company to work for in the 2007.) Taking care of business means taking care of your customers, your employees, the community and the environment while still making a profit. I guess it can be done. It’s nice to see someone raising the bar. This entry was posted on February 25, 2008, 5:47 pm and is filed under Cuisine, Culinary Arts, Food. You can follow any responses to this entry through RSS 2.0. You can leave a response, or trackback from your own site. Suffering a little Supermarket Envy? Alas, yes indeed. And a little career envy as well, if you know what I mean.